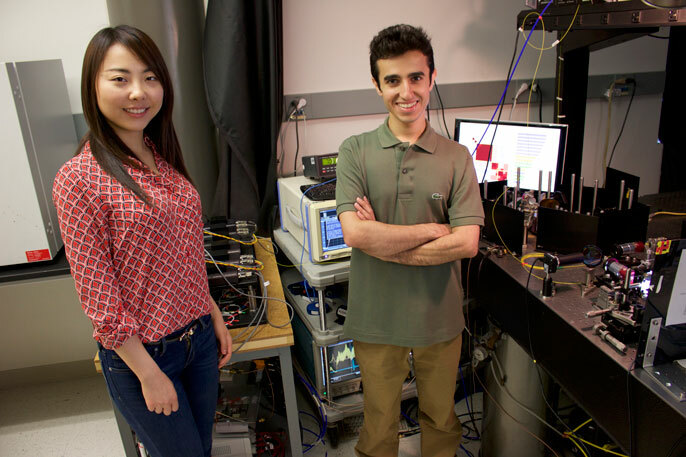 UCLA’s Claire Lifan Chen and Ata Mahjoubfar with the new device, which can image cancer cells extremely quickly and without damaging blood samples. The researchers write in the paper that the system could lead to data-driven diagnoses by cells’ physical characteristics, which could allow quicker and earlier diagnoses of cancer, for example, and better understanding of the tumor-specific gene expression in cells, which could facilitate new treatments for disease. The study’s other authors were Li-Chia Tai, Ian Blaby and Allen Huang of UCLA, and Kayvan Niazi of NantBio. The research was supported by NantWorks, LLC, the parent company of NantBio.